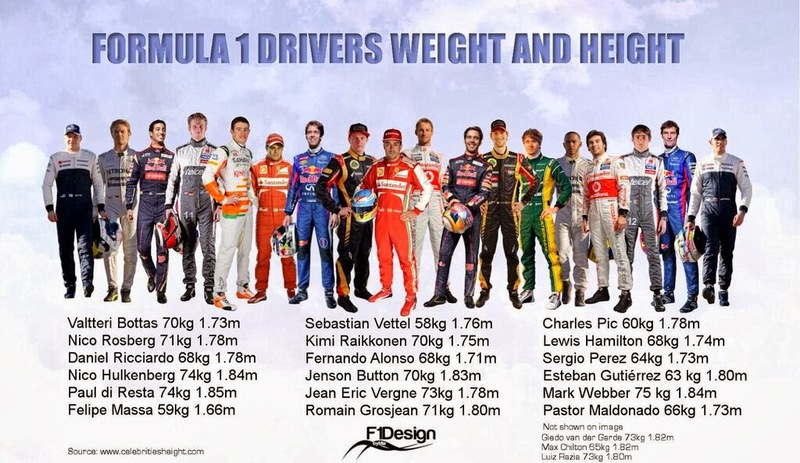 Formula 1′s smaller drivers should stand up for the big guys to prevent the larger men being frozen out of the sport because of their size and weight, lanky Australian Mark Webber said ahead of the Korean GP weekend. The regulations are changing next season with the introduction of a new V6 turbocharged power unit with energy recovery systems which will weigh considerably more than the current V8 engines. 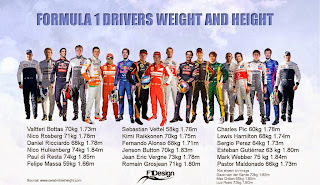 At present the car and driver – in overalls – must weigh a minimum of 642 kilos but while that will go up to 692 kg next year to compensate for the new unit, some drivers argue it is not enough and gives the lighter men a significant advantage. They would like a further 10 kg to be added on to the combined weight. “Everybody’s been asking me why I look so skinny but you have to be skinny because it’s to your advantage to be as light as possible,” Red Bull’s Webber told reporters at the Korean Grand Prix. “It’s a car performance advantage. Some team bosses agree and echo the Australian's views. Team principal at McLaren, Martin Whitmarsh believes that it is going to be a stretch for teams to achieve the minimum weight possible and any tall or heavy driver is going to be a challenge. "The truth is that the way the regulations have fallen now, weight is a bigger challenge," he said. "I have been speaking to another team principal to ask if they will hit the target weight, and they won't. "If you are not on the weight limit then having a driver that is nudging towards 80kg is a difficult thing to have. It is a simple equation - on average every 10kg is a third of a second." Whitmarsh fears that some teams may even take safety risks in trying to make components lighter in a bid to hit the weight target. "On every design team, there is a lot of pressure on them to save weight," he said. "Inevitably that costs money and people, when they are pushing for weight, they will pair down on margins of safety." In an interview with AUTOSPORT, when he was asked if there was a need to raise the weight limit for next year, which of course requires unanimous support from the teams, the Briton said: "I think there are grounds, but F1 doesn't work like that does it? "I think the teams now will have, and are working hard, to meet the weight limit and the team's self interests will prevail. "The team that thinks it is okay will block any change, and that is how things will work I am afraid. "Momentarily, maybe for one or two years, a heavier driver is going to be disadvantaged. That it not what was intended but that is how it has happened." Red Bull's team principal Christian Horner, whose doesn't expect to face any major issues with weight in 2014 with a line-up of Sebastian Vettel and Daniel Ricciardo agrees that the current situation is unfair. "Theoretically it is not a factor for us because we have got two drivers that are of a reasonable weight, but it does penalise a driver like Mark [Webber], who could have driven for us - or someone like [Nico] Hulkenberg," he said. "It would be a factor in signing a driver like him: which cannot be right. He shouldn't be penalised for being more than six foot. "For sure the engine with all its ancillaries and cooling requirements is heavier as a unit, and it [a change to the weight limit] perhaps is something that should be looked at."